Each Office application has its own trust center/macro security settings. In 2013 this can be accessed from (File > Options > Trust Center). The Trust Center replaced the Security dialog box in 2007 and contains all the information relating to macro security. There was a "Trust all installed add-ins and templates" checkbox in 2003 but this was replaced by trusted locations in 2007. All macros in trusted locations are always allowed to run and are excluded from the Trust Center security settings. These settings have always been a source of confusion and still are. First of all we think they are in the wrong order and second of all "without notification" should be added to the description shown below. Here is our summary of what the different options mean and notice that we describe them in a slightly different order to the order in which they appear on this dialog box. (1) Disable all macros without notification (Very High) All macros and security alerts are disabled. If there are any documents that contain unsigned macros that you want to use you need to put them into a trusted location. All macros, not in trusted locations are disabled (signed or unsigned). (2) Disable all macros (without notification) except digitally signed macros (High) In the screenshot above this is actually the third option. All macros are disabled except for those that have been digitally signed by a trusted publisher. You will only see a security alert when you open a document that has a digital signature that does not appear in your trusted publishers list. All unsigned macros are disabled without notification. (3) Disable all macros with notification (Medium) (Default) In the screenshot above this is actually the second option. 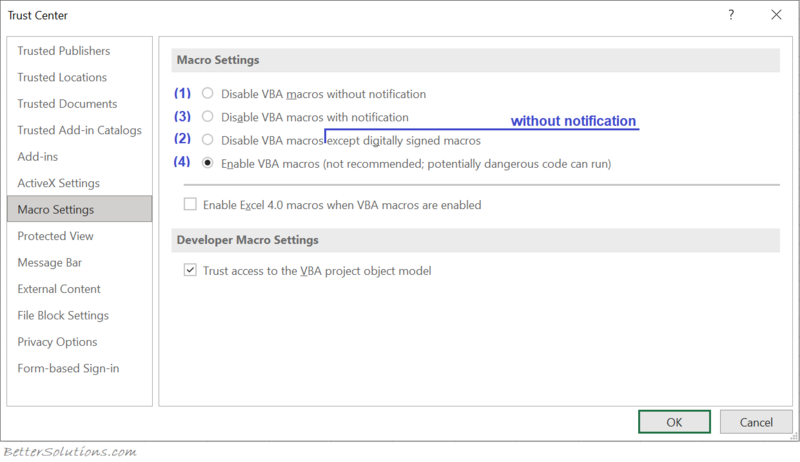 A security alert is displayed every time you open any document containing macros (signed or unsigned). This lets you make the decision on a case by case basis. This is the default setting. (4) Enable all macros (Low) All macros are enabled and will run (signed or unsigned) and you will never see any security alerts. Using this setting is not recommended as it makes your computer vulnerable to potentially malicious code. Trust access to the VBA project object model (Default is off) This setting is for developers and is used to allow programmatic access to the VBA object model from any Automation client. For any Automation client to be able to access the VBA object model programmatically, the user running the code must explicitly grant access. This option was available in 2003 and has not changed. All macros in trusted locations are allowed to run regardless of your macro security setting. If you try to access the VBA object model at run time and the "Trust Access to Visual Basic project" checkbox is not checked the following message will be displayed: "Programmatic access to Visual Basic Project is not trusted". Excel cannot actually check if any viruses are present in a workbook, it can only warn you of the possibility. If you are unable to change the security level then your network administrator may have enforced a security level for your workgroup or corporation to ensure that you only use macros that are from trusted sources.